The board game below is part of a Graphics project. It has been made from a selection of materials including a variety of coloured card. The packaging is composed of white card and has been sprayed with ordinary spray paint. The lettering has been added by the use of CAD software and a vinyl cutter. A picture has been glued to the lid - this is a colour printout from a typical ink jet printer. Safety symbols have been added including the toy and hobby association symbol and recycling symbol. All appropriate symbols including bar codes are also included. The packaging (lid and base) have been cut from a single sheet of thick card with the fold lines ‘scoured’ with a craft knife. The lid and base have been folded accurately and joined with double sided tape. The insert to the packaging has been manufactured through vacuum forming of high density polystyrene over a former. The dice have been made from MDF, sprayed with the dots added with a felt pen. A set of instructions has been added. This was printed on good quality card and given a plastic coating with sticky back plastic. 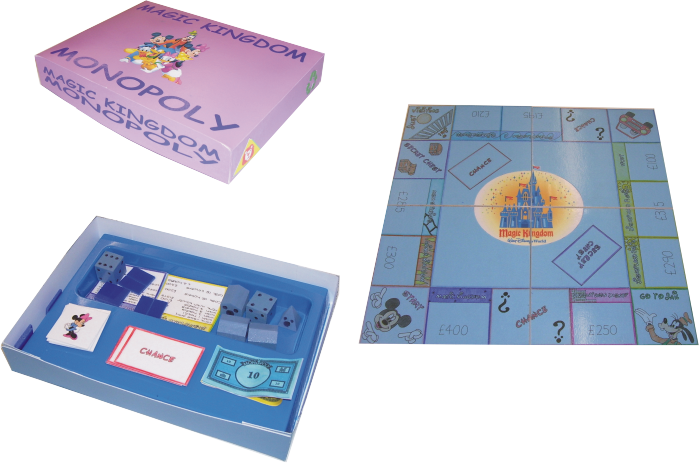 The board game is composed of thick white card. It has coloured paper glued to the surface and graphics added. The board is in four parts held together with reinforcing tape. This is a very accurate prototype made to the highest possible standards. this could be used with a focus group of potential customers. They could play the game, test out the quality of the materials and make recommendations regarding improvements.